Almost two years ago, we watched a documentary about beer. And Dogfish Head Craft Brewed Ales was one of the featured breweries. They have been a favorite of ours ever since. Their flavor combinations, especially their Ancient Ales line, are outrageous. I have found them at Post No Bills...and, then, I saw this, this week, at Whole Foods: Midas Touch. Cheers! The Ancient Ales formulae were created from the chemical analyses of residue found on pottery and other drinking vessels from different archaeological sites. Sweet! A little archaeology and chemistry with my ales. I love it. As of 2014, I think that six such brews have been crafted, and only one - Midas Touch - is produced year round. The others are produced on a limited basis. I've only tracked down two of them. Both are spectacular. *I served this with our Chicken Taco Casserole tonight. It was a great marriage of tastes. 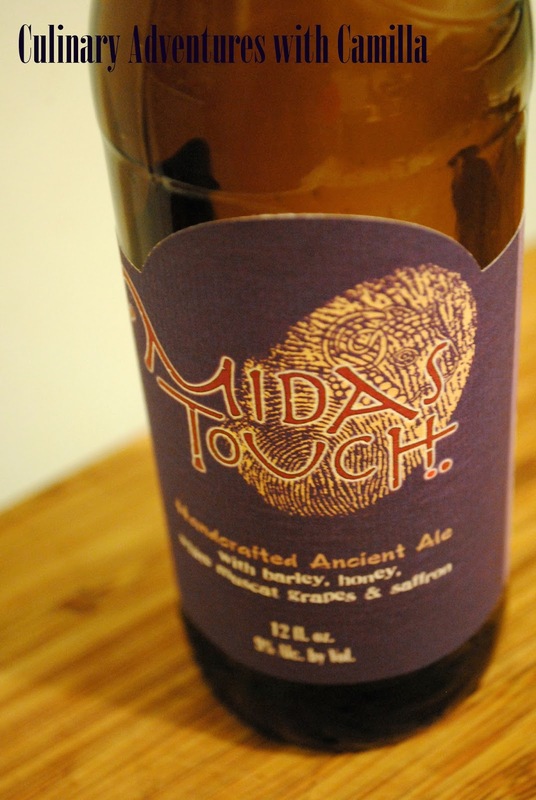 Midas Touch was inspired by molecular evidence found in a Turkish tomb believed to have belonged to King Midas. The only other Ancient Ale I've tried is Theobroma. It's a veritable celebration of chocolate based on the chemical analysis of 3,000-year-old pottery fragments found in Honduras. Chateau Jiahu is brewed with hawthorn fruit, sake rice, barley and honey, residue unearthed from a 9,000-year-old tomb in China. Ta Henket plucks its ingredient list from Egyptian hieroglyphics. Birra Etrusca Bronze proves that wine isn't the only thing on an Italian's dinner table; its basis is a 2,800-year-old recipe using heirloom Italian wheat, hazelnut flour, pomegranates, and Italian chestnut honey. 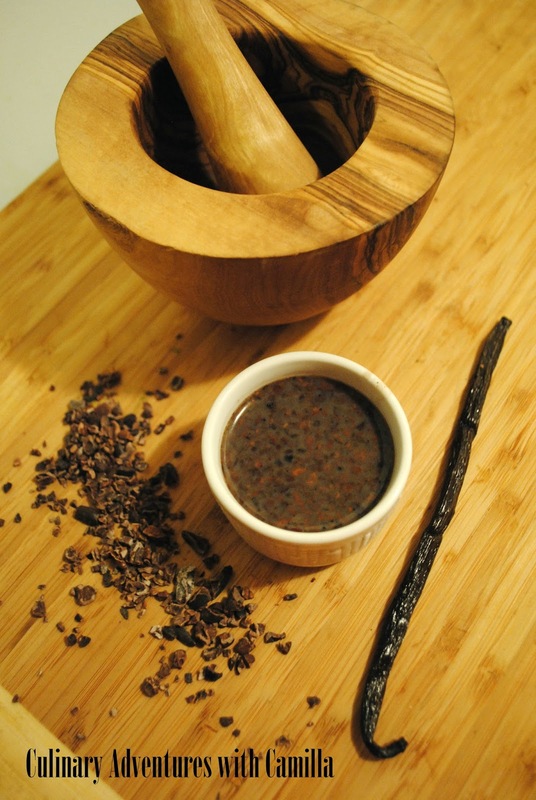 And the latest formulation is Sah'tea, relying on a 9th century Finnish recipe that includes rye, juniper and black chai tea. I think I need to figure out where to get my hands on those other Ancient Ales. Stat. Earlier this week I posed a question. And this was my social media-conversation with a friend from high school. Jill Chicken taco casserole! Nothing you'd ever make (too easy and too many canned foods involved) but I'm pretty sure it'll be a crowd pleaser! Camilla @Jill, that sounds like something my boys would LOVE...well, not the canned part...but they love chicken tacos. What else goes in there? Camilla Okay, Jill. I'll give it my own twist sometime. Maybe this weekend. I'll keep you posted. Jill Forgot to mention sour cream mixed in too. I'd love to see your version! Melt butter in saucepan over low heat. Whisk in the flour, salt, and pepper. 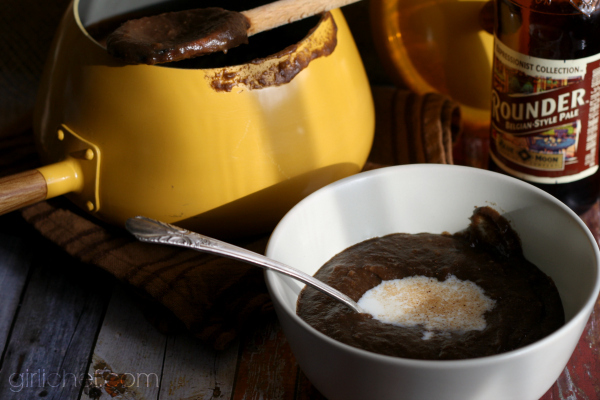 Continue cooking over low heat until the mixture is smooth and bubbling. Remove from heat and pour in the milk and duck stock. Place the pot back on the heat and bring to a boil again, stirring constantly. Boil and whisk until thickened to desired consistency. Stir in the sour cream and tequila. 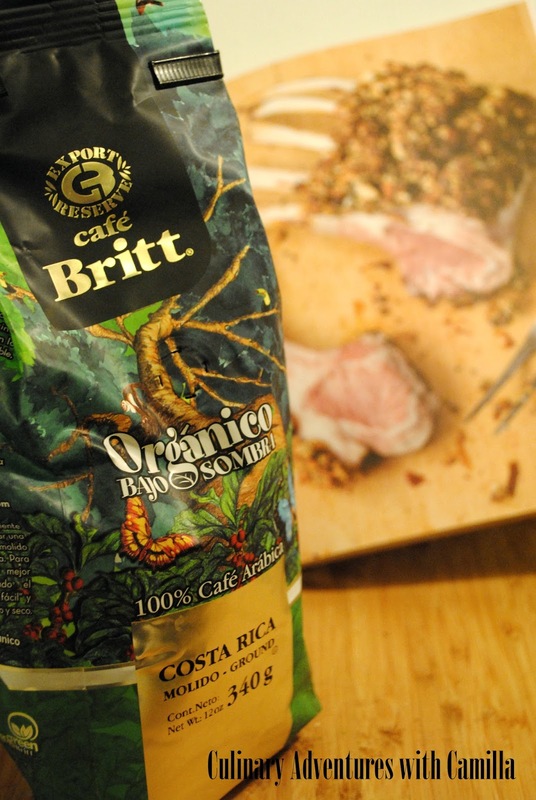 Season with freshly ground salt and freshly ground pepper. 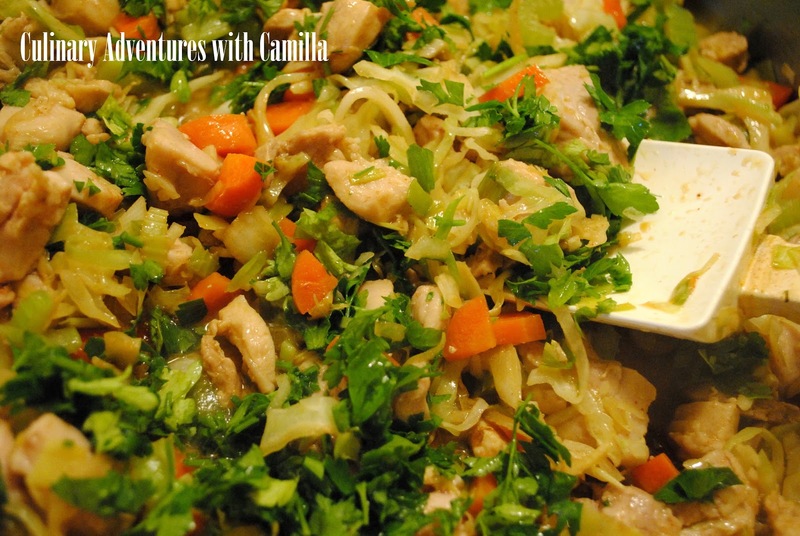 Preheat oven to 350 degrees F. In a large, flat-bottom pan, saute your leeks, celery, and carrots in a splash of olive oil. 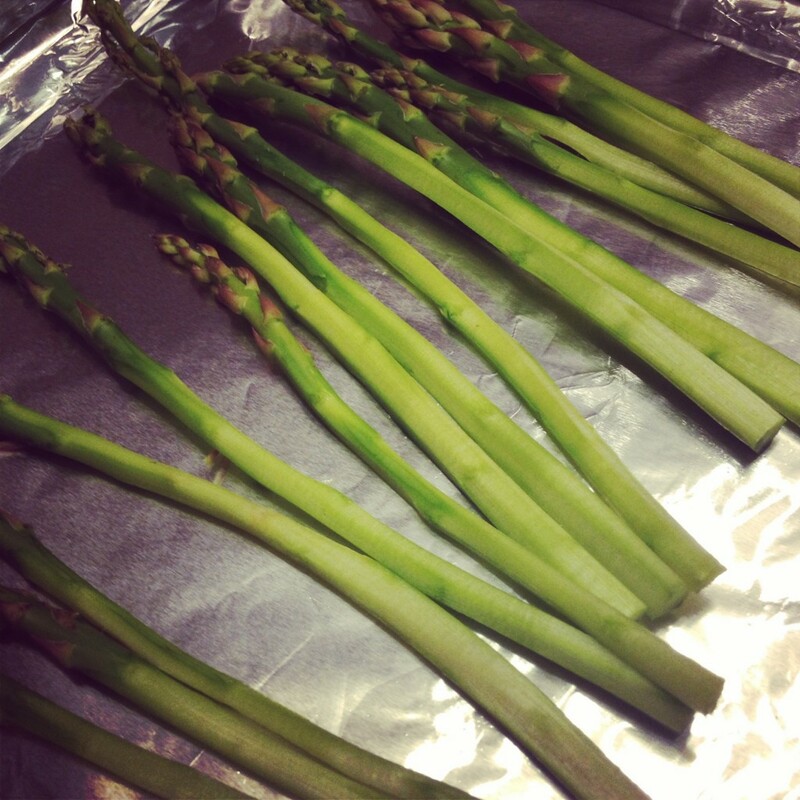 Cook until they are softened and the leeks are becoming transparent. Add in the chicken and brown till completely cooked. Add in the cabbage and black beans and cook till warmed through. 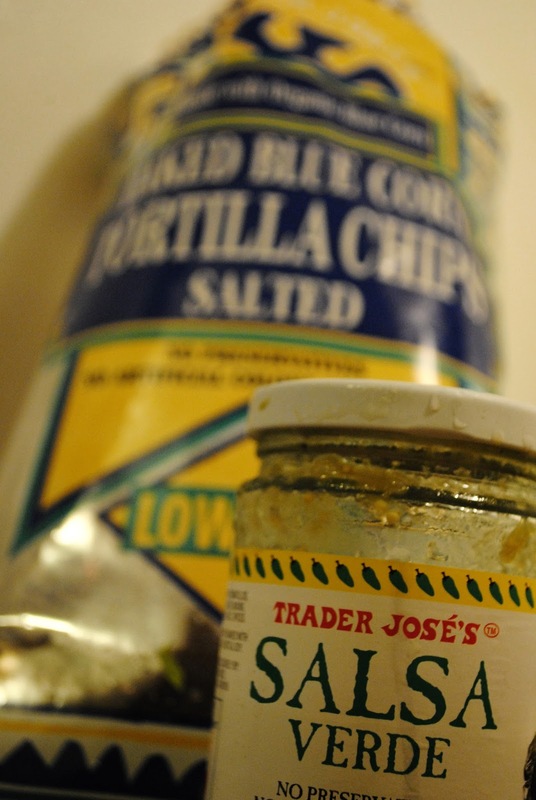 Stir in the salsa verde, 1 C of mixed cheese, 1/2 C sour cream, and the cream sauce. 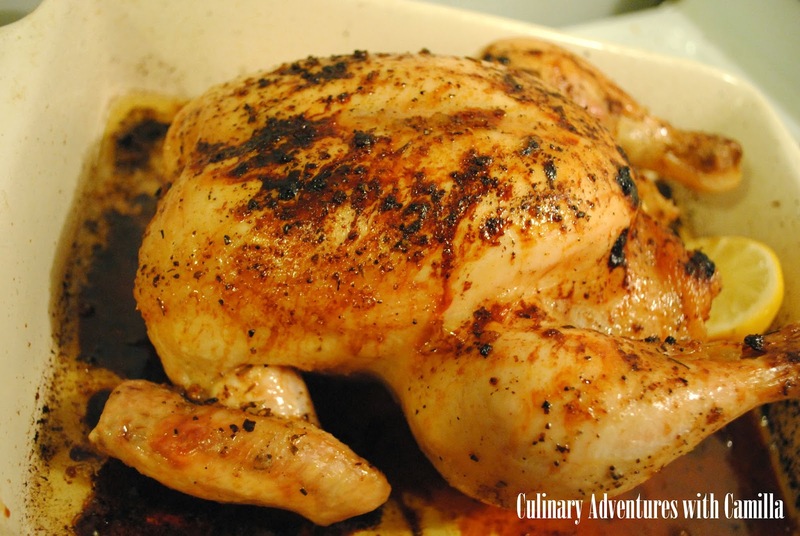 Butter your baking dish and spoon half of the chicken into the dish. Cover it with a layer of corn chips and 1 C of cheese. Spoon in the rest of the chicken. Cover that with a layer of corn chips and the rest of the cheese. Cover with foil and bake for 15 minutes. Uncover and bake for another 10 minutes. The casserole should be bubbling. Let cool for 10 minutes before serving. 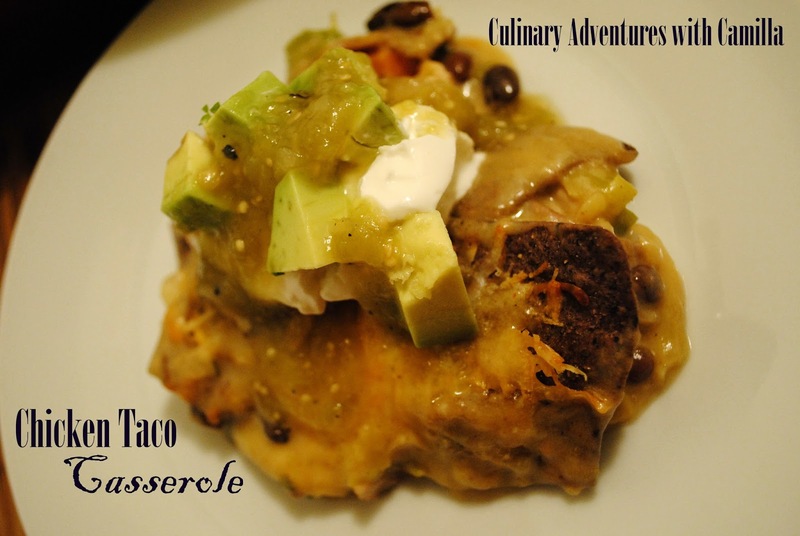 Top with a dollop of sour cream, cubed avocado, and another drizzle of salsa verde. Funny story: as I was layering this all together, Jake walked into the kitchen. "I've had that before. It's a casserole, right? You don't normally make casseroles." I know. I told a friend of mine from high school that I would try to create a fewer-cans version. "Cool. 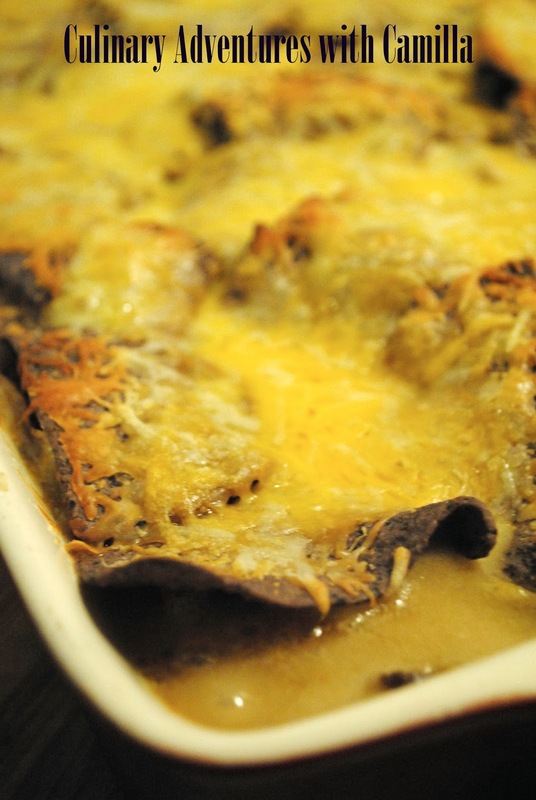 The kind I've had only had the chips on the top - not layered inside like a Mexican lasagna." Yeah, well, I never saw a photo. So I made it up. Mexican lasagna. Sounds like something I would make. The verdict: "The taste was good, Mom, but we don't understand the chips." Okay. Me neither. 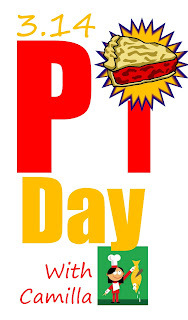 Pi Day is coming up. Pi Day? you ask. You know. March 14. 3/14 = 3.14159265359 or pi. Also known as a great excuse for Cam to make pie. Over the holidays we were invited to a pie tasting party. In preparation, discussions began around our dining room table: What makes a pie a pie? I'm looking to all of you for some pie inspirations. Feel free to link up to three pie recipes. Think sweet. 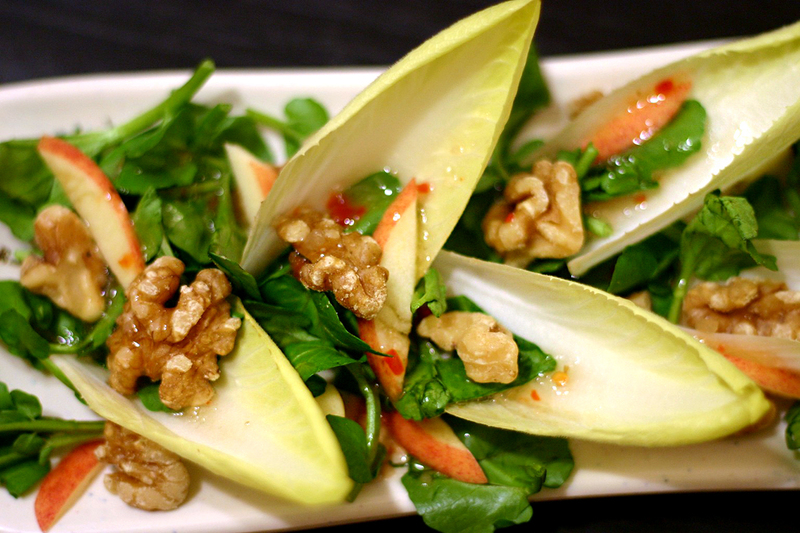 Think savory. I'll post a round up in time for you to create some of them for your Pi Day celebration if you wish. In a large saucepan, add a splash of oil and toast the cumin seeds and fennel pollen. Once they are aromatic, add the onion and cook till translucent. Stir in the tomato and cook until softened and beginning to break down. Season with turmeric. 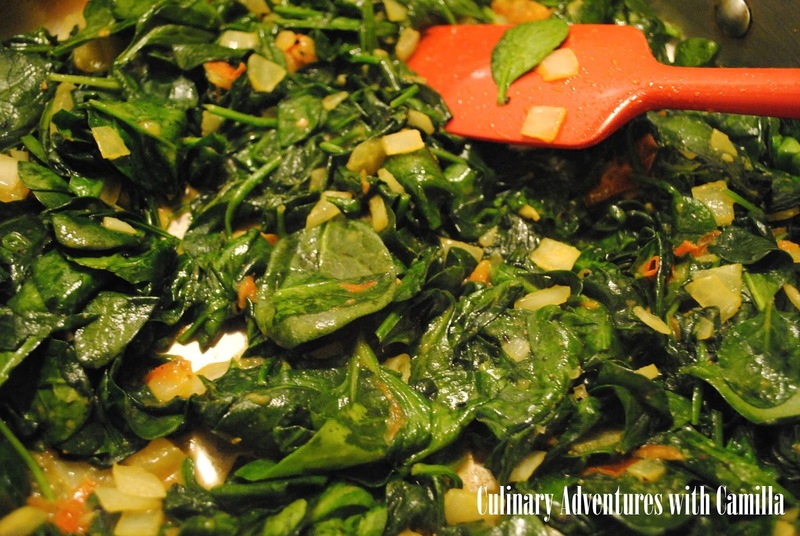 Add the triple-washed spinach to the pan. One pound look like a lot, but it shrinks as it wilts. 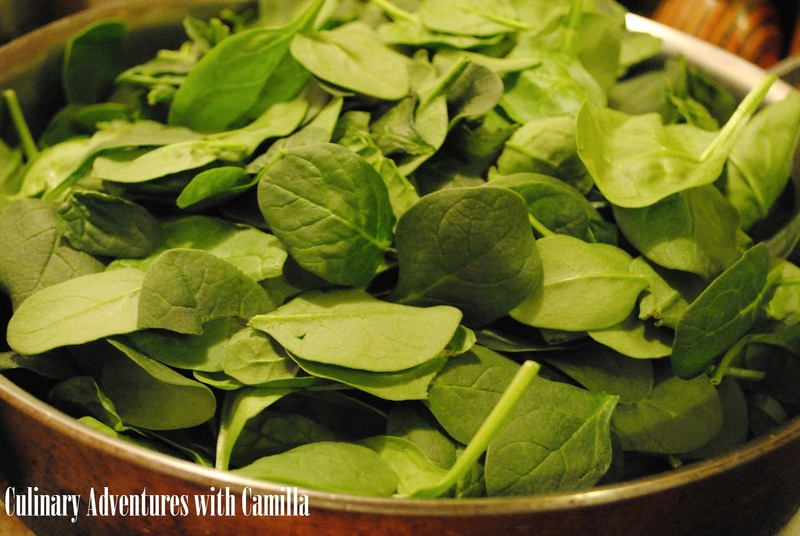 Remember not to overcook the spinach as it will go from that gorgeous bright green to a murky olive if cooked too long. 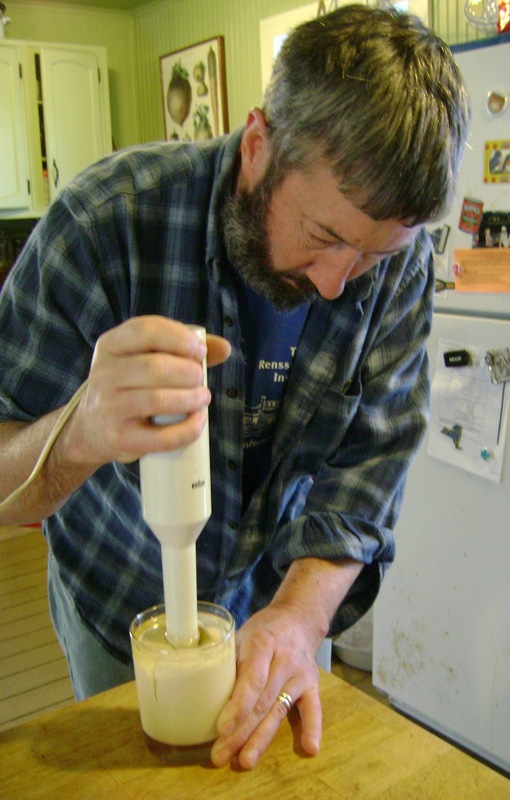 Squeeze in the juice from the lemon and if you have an immersion hand blender, use that. 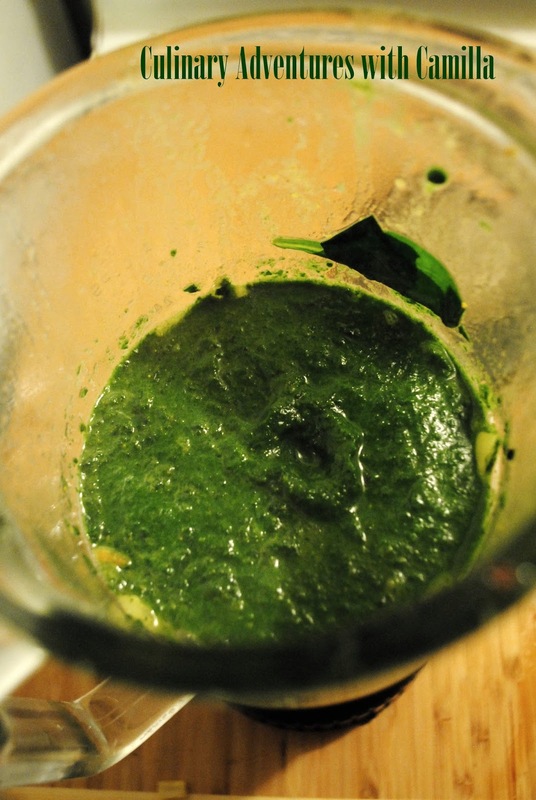 I don't have one, so I use a traditional blender to puree the spinach mixture. Cube the paneer. You can pan-fry them but I prefer to use them fresh. Add the paneer cubes to the spinach puree. Season to taste with salt and pepper. 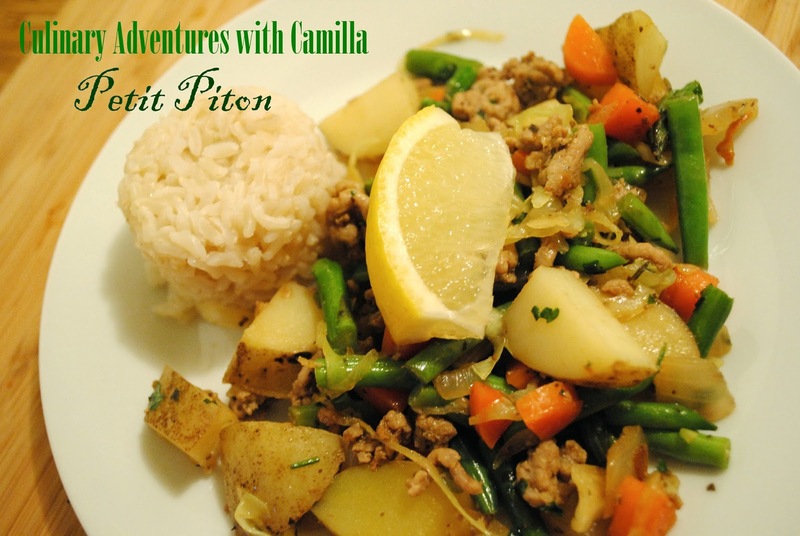 Serve over rice and alongside some naan. I have had Laurey Masterton's The Fresh Honey Cookbook: 84 Recipes from a Beekeeper's Kitchen* on my bookshelf for an embarrassingly long time. After my cover and article on honey - Bee Yourself - was published in Edible Monterey Bay's Summer 2013 issue, a few publishers sent me honey cookbooks to review. Storey Publishing was one of those and this is one of the books. The photos - by Johnny Autry - are vibrant and make you wish you could stab your honey-dipper straight into the scenes. And Masterton's recipes? Well, read on. I procrastinated on cooking from this book not because it wasn't inspiring, but because it was too intriguing. Is there such a thing? Yes. Precision procrastination. Is that a real thing? No, I just made that up; but after months of holding on to this book, considering the recipes, and drooling over the photos without ever taking out a pan, that's what I'm calling it. Masterton guides the reader through an entire year of honey. The book is divided into chapters with each chapter focusing on one honey varietal. Think tupelo honey in February, acacia honey in March, sourwood honey in July, and cranberry honey in November. 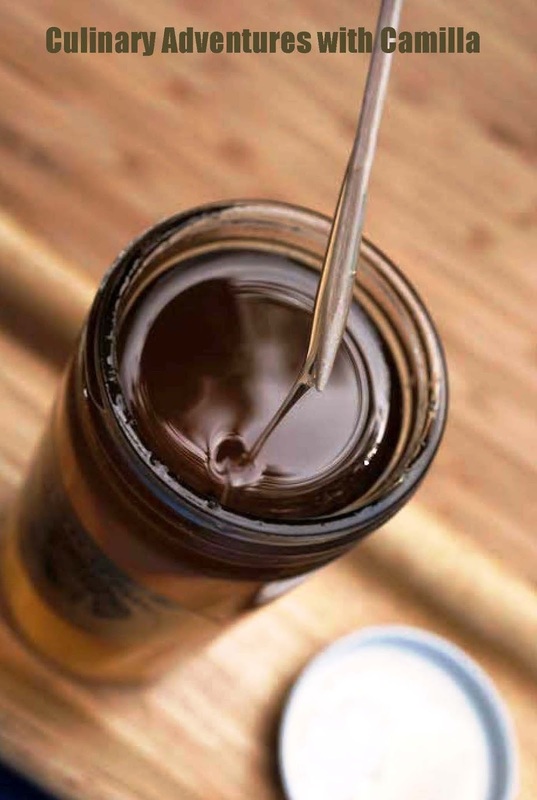 She details the taste, color, and smell of each and offers recipes utilizing the honey-of-the-month. 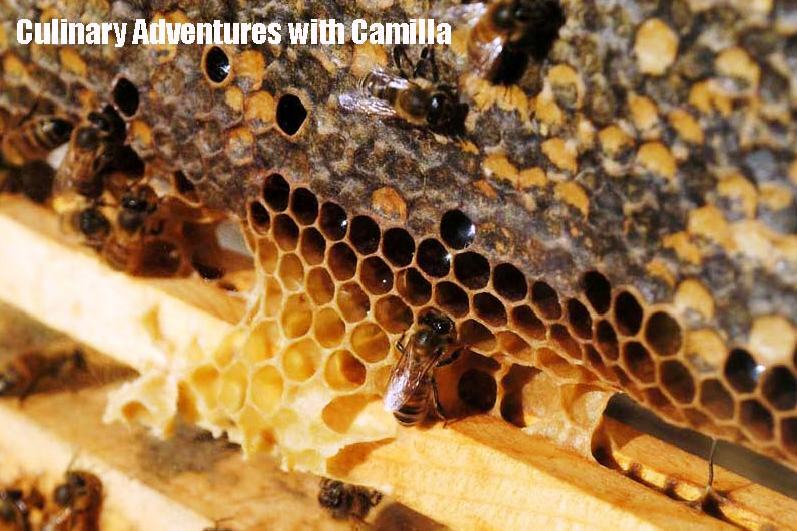 And interspersed in all of that are explanations of what is going on the hive during different seasons and candid tales of her trials and tribulations of beekeeping. Eighty-four recipes celebrate the luscious flavors of honey. My hang-up: Though the featured varietals are optional - with any kind of honey being used - I wanted to make the recipes exactly as written. And, for those who know me, you know I never do that. I am always adapting; I am a fairly fast and loose cook. Masterton inspired me to want to be precise. Masterson is a beekeeper, café owner, caterer, chef, and spokesperson for The National Honey Board. And, in this book, she wears all of those hats, seamlessly moving from one to the other. In the end, I had to vanquish my best intentions to track down tulip poplar honey and the others. I went with what I could find locally - pine honey, sage honey, lavender honey, and avocado honey - and finally, finally hit the kitchen. 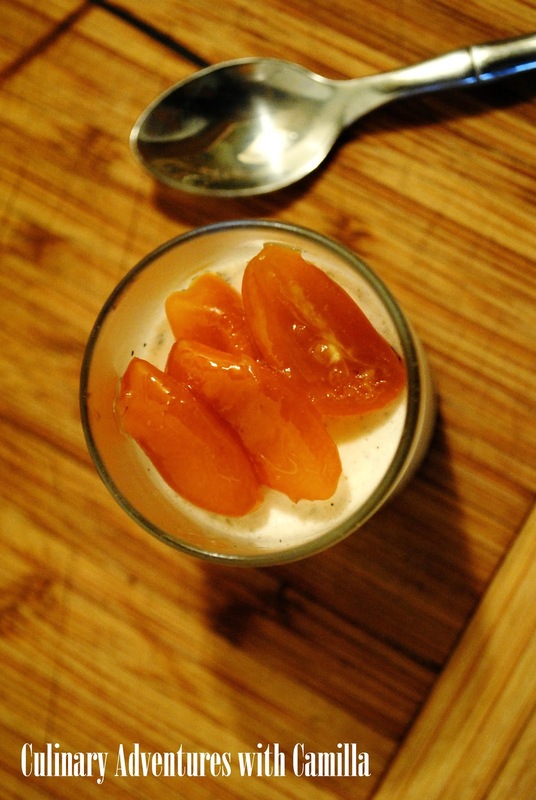 We candied kumquats in honey and spooned them over a vanilla bean panna cotta; we drizzled it over chicken for the most juicy roast I've ever made; and we dottted a cold potato vichyssoise with honey. 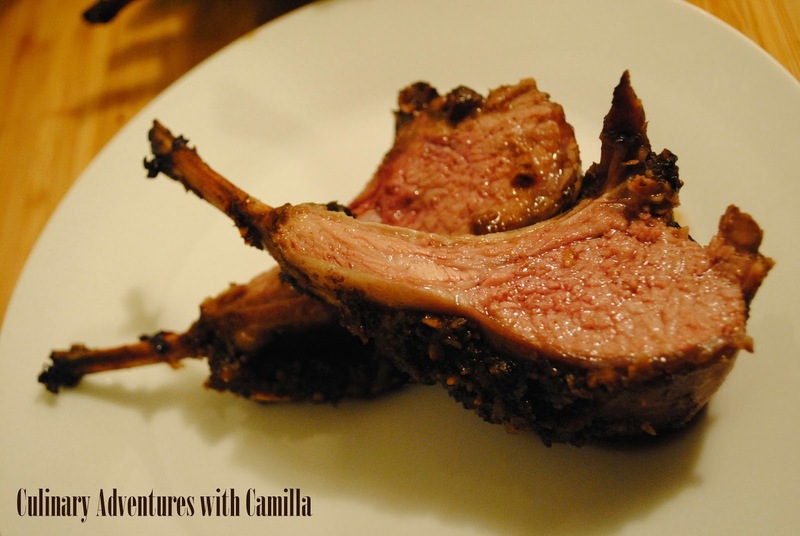 The recipe I'll feature in this review is an adaptation of Masterton's Rack of Lamb with a Coffee and Avocado Honey Crust. I did actually find avocado honey - Masterton's featured honey for April - and a friend had just brought me some organic coffee from his trip to Costa Rica. Thanks, Miles! Preheat the oven to 375 degrees F. While the oven heats, make a paste with the breadcrumbs, dried coconut, honey, mustard, garlic, ginger, salt, and pepper. Mix until just combined. Press the paste onto the meat-side of the rack and lay it in a baking dish. Pour the coffee into the bottom of the baking dish. Bake for 15 minutes - until the crust is set. Then baste every 10 minutes with the coffee mixture. Bake until the thermometer reads 140 for medium well. Transfer to a cutting board and let rest for 5-10 minutes - the meat will continue to cook. 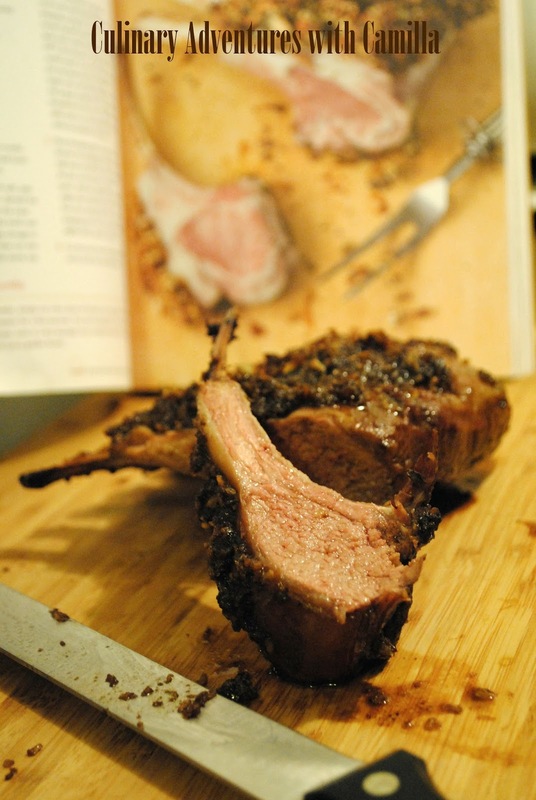 145 degrees renders the lamb medium well. In the meantime, simmer the drippings and remaining coffee over medium to high head. Add the coffee stout to deglaze the pan. Simmer till it thickens to your desired consistency. 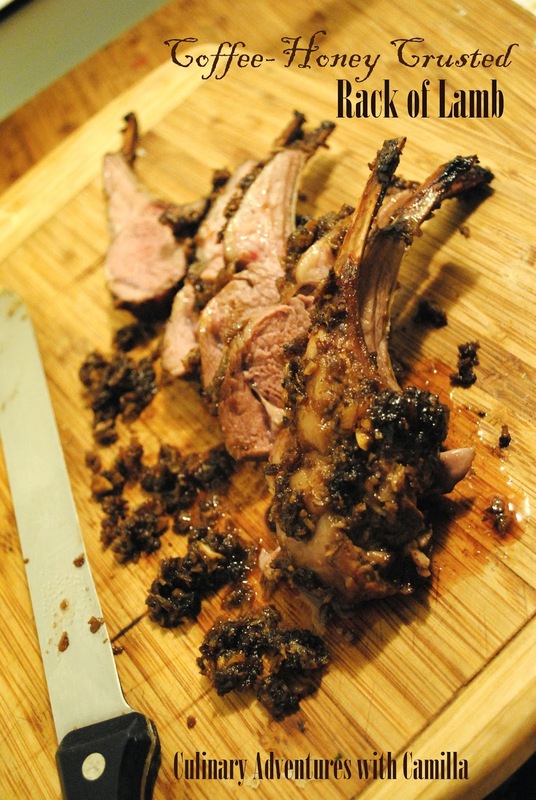 Slice the rack into rib portions and serve with the reduced sauce. 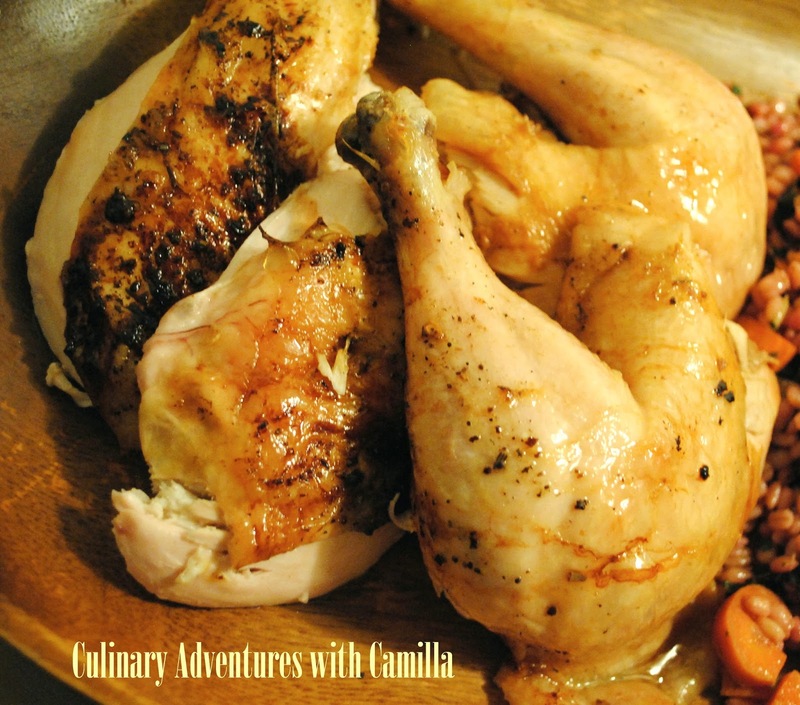 This cookbook is delightful - it's thoughtful and delicious. And I will keep it close at hand for inspiration as I find different kinds of honey. 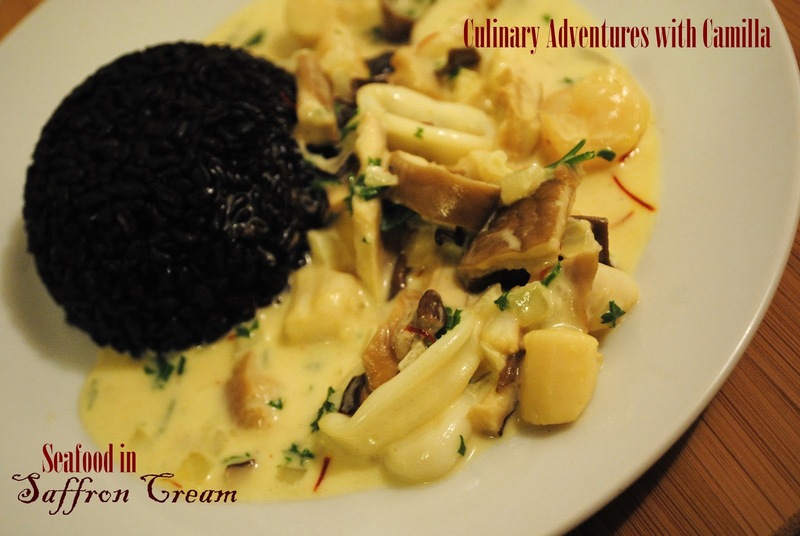 * Note: I received a complimentary copy of the cookbook from the publishers for the purpose of reviewing it. However, all opinions are 100% my own and 100% accurate. + These were additions or adaptations from my kitchen. 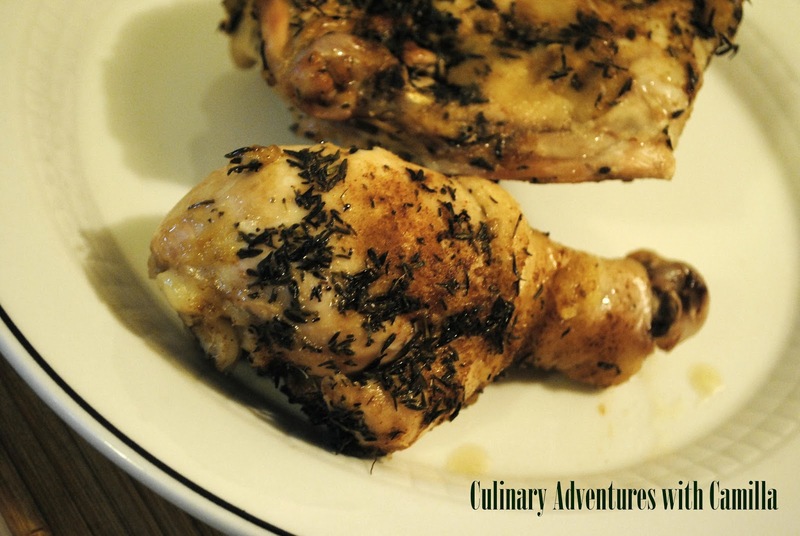 This month I invited bloggers to join me for February's Food'N'Flix event to watch - and cook from - Babette's Feast. It's a fantastic foodie flick that culminates in a haunting dinner: the titular Babette's Feast. Babette is a French refugee who is living in Denmark and working as a servant for two sisters. During this veritable parade of haute cuisine, and celebration of the sisters' father, we discover that Babette was once the head chef at Café Anglais in Paris. Babette spends her entire lottery winnings on the ingredients and wines for this dinner. When the sisters ask her when she'll be leaving them to enjoy her winnings, she reveals that she has no money left; a dinner for twelve at Café Anglais costs 10,000 Francs. I read somewhere that 10,000 Francs (in 1871) would equal about $60,000 in today's dollars, taking inflation into consideration. What a dinner! Speaking about an impressive dinner, look what the Food'N'Flixers brought to the table this month. Here's our virtual feast...from appetizers to salads and soups, from a hearty main dish to two decadent desserts. Nice job, everyone. 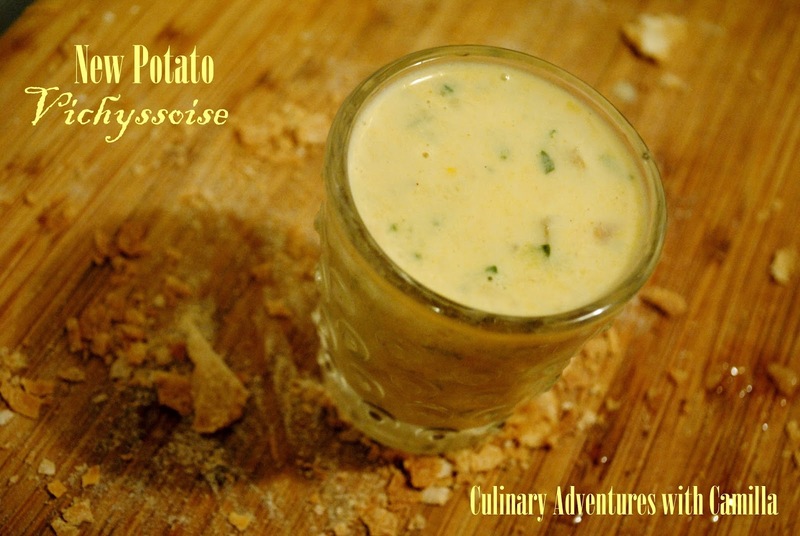 Click on the titles to go to their recipe posts! Enjoy. Evelyne from Cheap Ethnic Eatz had originally gone to Chinatown in search of turtle meat; she had seen it there a couple of years back. But, alas!, it wasn't to be found. She opted for this fresh, elegant salad. I wish I lived closer to Evelyne. I would definitely crash her annual Food Film Marathon! Caroline from Caroline Makes baked a beautiful cake with her deep, dramatic Nordicware bundt cake. Think rhubarb, custard, and a rhubard-custard sweets drizzle! She had me at 'rhubarb.' I, however, have never ever seen canned rhubarb. So, I will have to wait till rhubarb makes its appearance at our markets this Spring. Sarah from Well Dined brings a low and slow cooked beef stew to the party that has an entire bottle of red wine in it! Cheers! I laughed at her "brown food = flavor" instruction. My mom used to say "Cook it till it has a tan." Same concept, I guess! 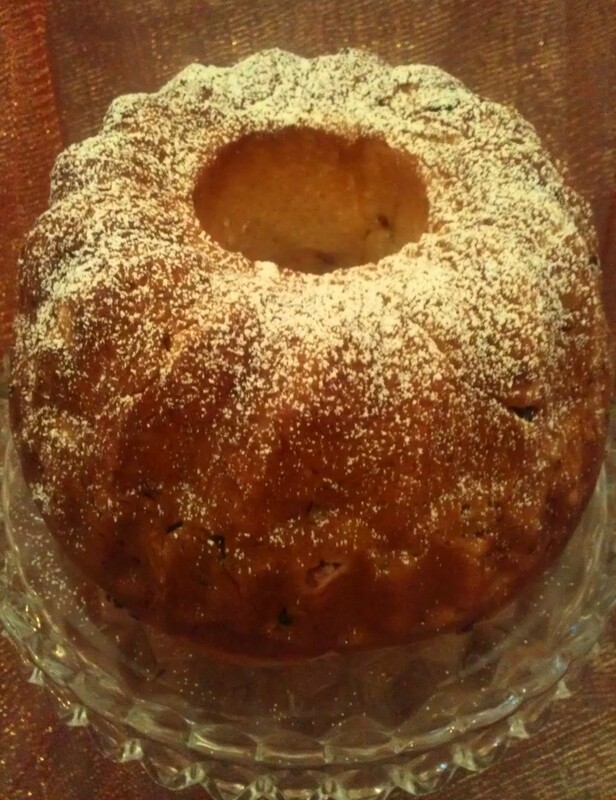 Debra from Eliot's Eats baked an impressive rum-soaked cake. She writes: "To cover my bases, I decided to douse the dried fruit with rum." That, my friend, is always a good plan. I steered clear of Babette's desserts, but this might inspire me to get baking. 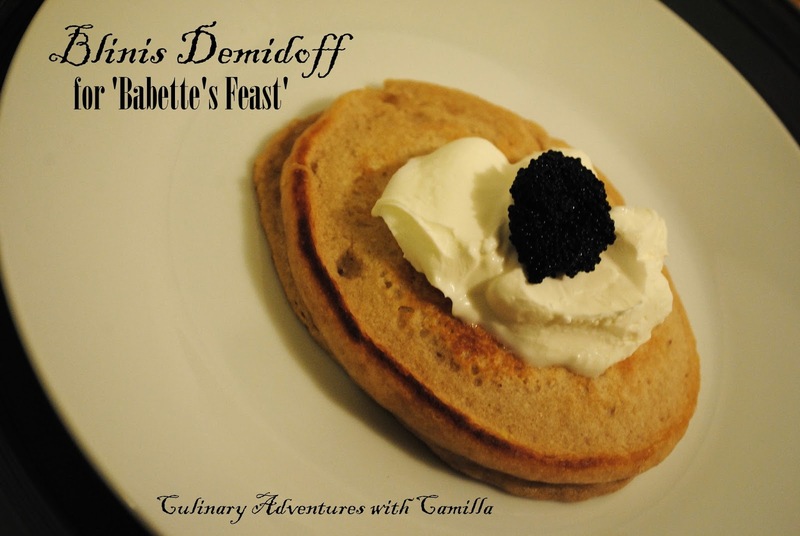 Deb from Kahakai Kitchen adapted the Blinis Demidoff into a veg-friendly version. 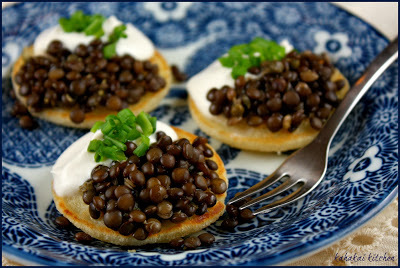 I absolutely love her take with the addition of seaweed and a dollop of cashew cream...and I had no idea you could buy pre-made blinis. That's a great shortcut tip. These look fabulous, Deb. Heather from girlichef went the other direction with her submission. 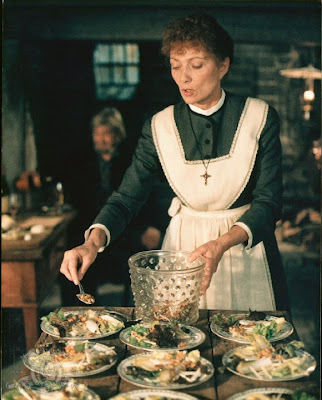 Instead of focusing on the food from Babette's feast, she cooked the simple, modest soup that the sisters and Babette eat all the time.... Heather is always surprising! 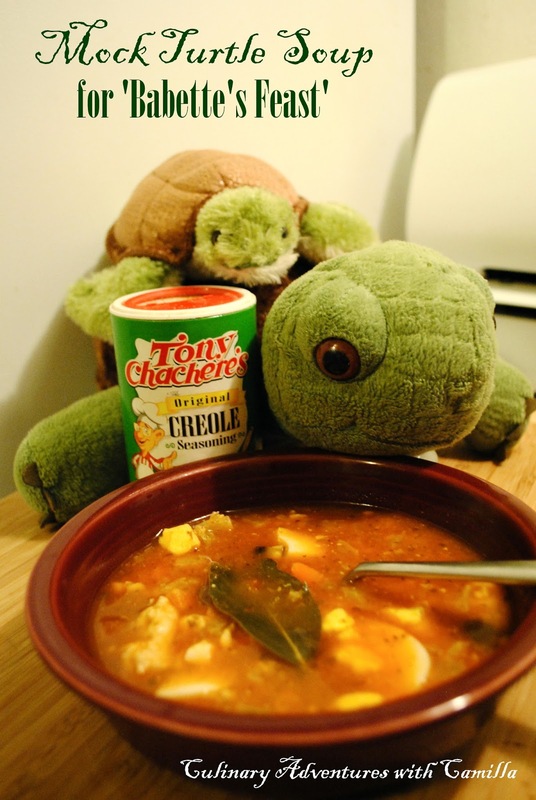 I - Culinary Adventures with Camilla - was also intrigued by the turtle soup, but knew that I wouldn't be able to find any turtle meat and, really, wouldn't be able to get my boys to eat it even if I could find it. So, I opted to go the 'mock turtle' route and kicked off the dinner with some blinis. My kids were horrified enough that I kidnapped their stuffed animals for a photo op. And that's a wrap on this month's Food'N'Flix. Thanks so much, all, for watching and participating! Deb from Kahakai Kitchen is hosting next month. She selected Stranger Than Fiction. That's a new one for me. Can't wait! Keep an eye out for her official invitation. 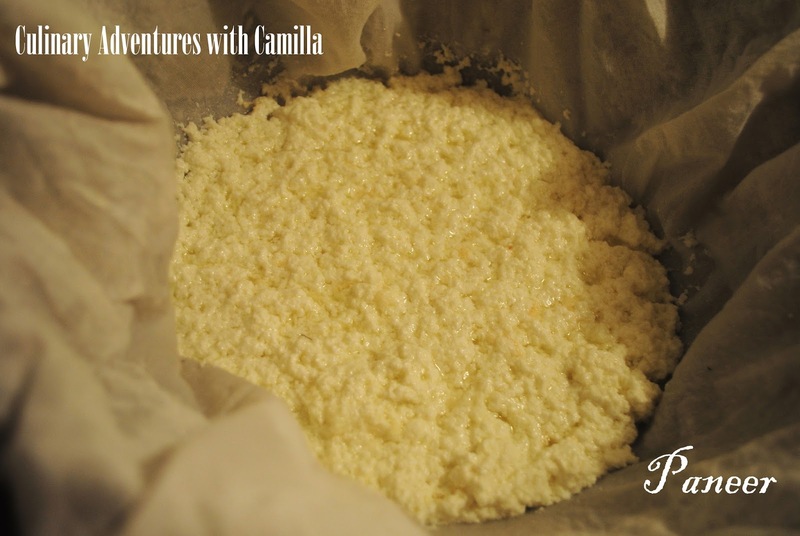 This year - 2014 - started our adventures in cheesemaking. We're not very accomplished yet, but we are trying! We've made homemade marscarpone, homemade ricotta, and homemade labneh korat (a yogurt cheese). 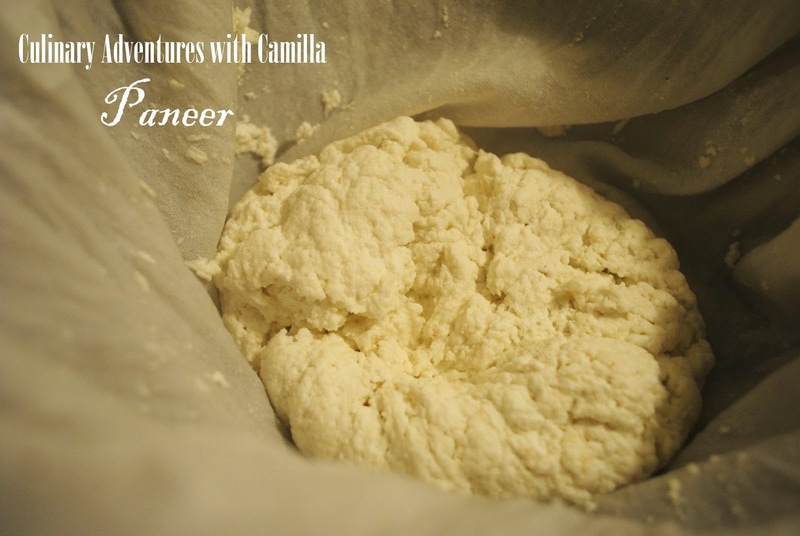 Tonight I decided to give homemade paneer a whirl while the boys were asleep. 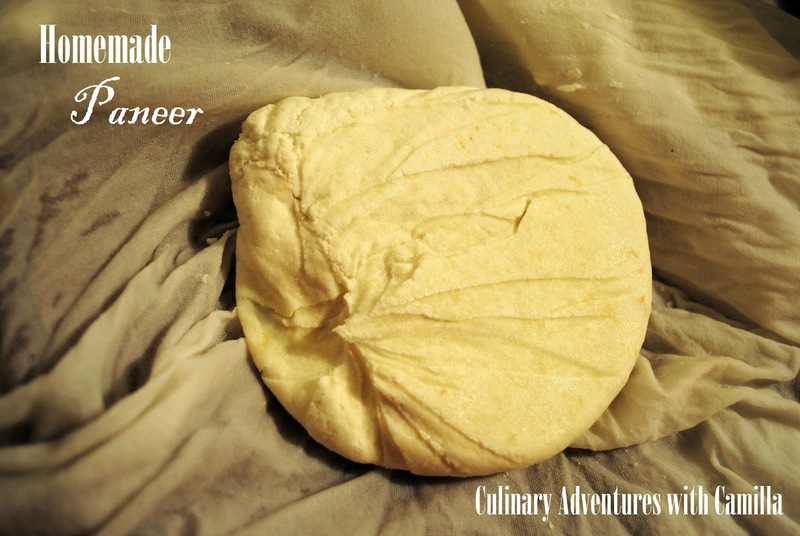 Paneer is an Indian cheese with a a mild flavor and slightly chewy consistency. It holds its shape well and doesn't melt; so you can saute it, grill it, or crumble it into just about anything. 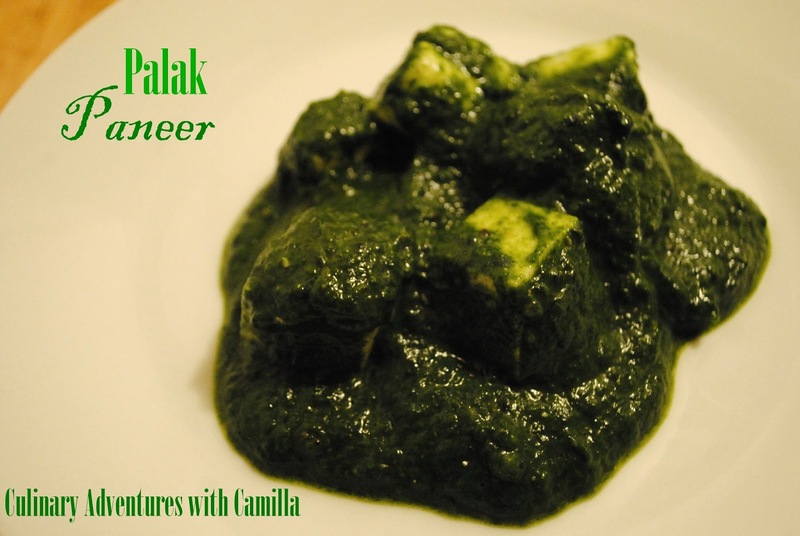 And it's a must for classic Indian dishes such as palak paneer. One of my friends gave me one of her recipes: Paneer Pizza. "Sauté the paneer in tandoori spice, spread over flatbread, bake, then drizzle with yogurt and chopped cilantro." Yum, Priya! I can't wait to try it. 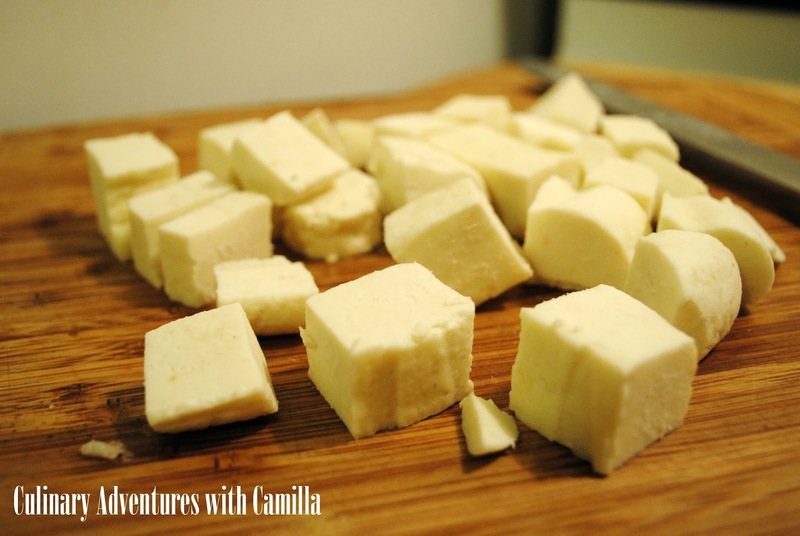 Paneer is so easy to make, requiring nothing more than milk and lemon juice. I added a little bit of salt. Line a colander with a cheesecloth. In a large souppot over medium heat, bring the milk to a boil. Take care not to let it boil over. When it comes to a boil, turn off the heat and add 2 tablespoons of lemon juice and salt. 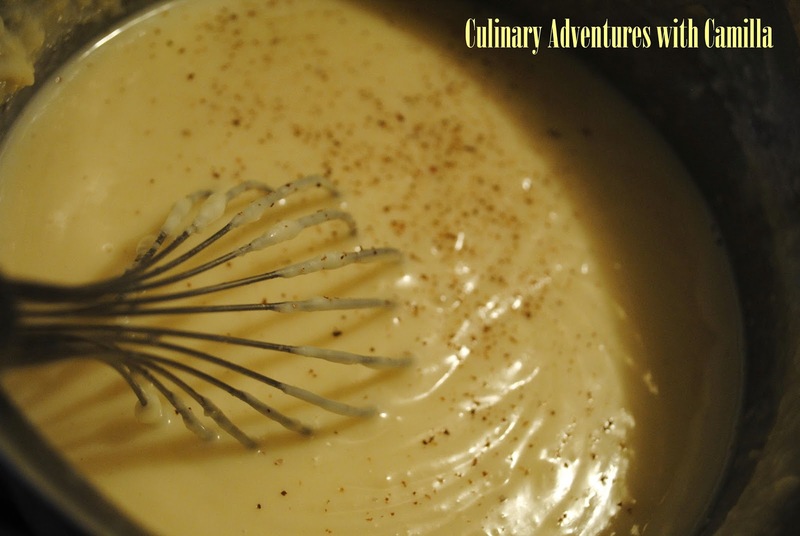 Stir with a spatula until the milk separates into curds and whey. If it doesn't seem to be separating completely, add another tablespoon of lemon juice. Pour the curds and whey into the cheesecloth. Let drain for 10 minutes. Once it has cooled for 10 minutes, it should be cool enough to handle. Gather the corners of the cheesecloth and squeeze out as much of the liquid as you can. 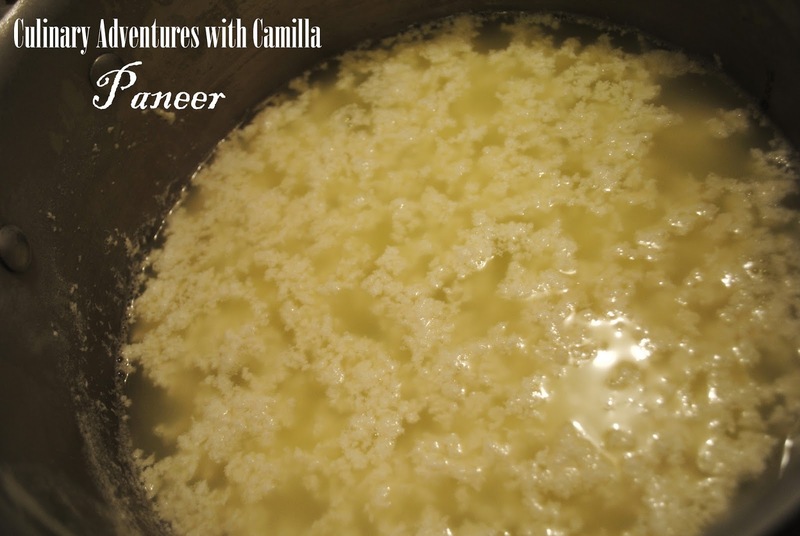 This can be used it immediately as cottage cheese or ricotta-style cheese. To press it into a solid cheese, place the cheesecloth - wrapped into a bundle - in the middle of a plate with a lip to catch the liquid that will be expressed. Put another plate on top and press until the bundle has flattened into a disk approximately 1" tall. 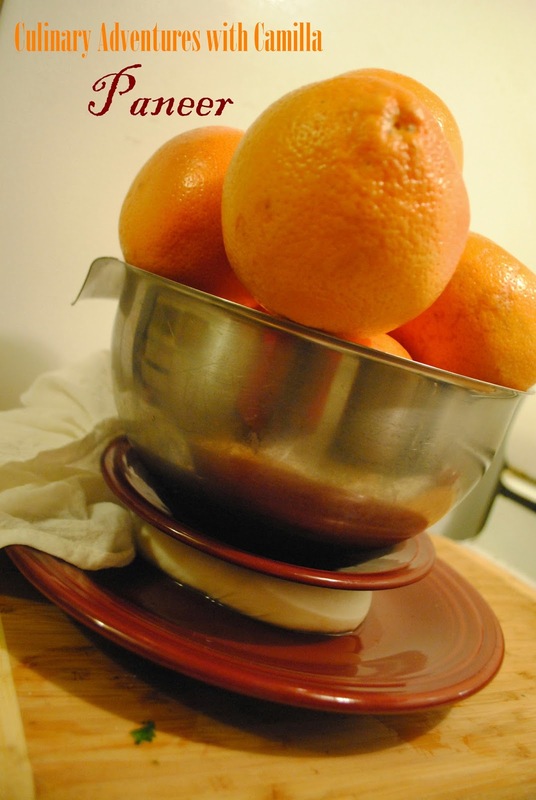 Leave the plate on and weight it down with something heavy - I used eight grapefruits. Press the cheese for at least an hour. Drain off the liquid and unwrap the paneer. 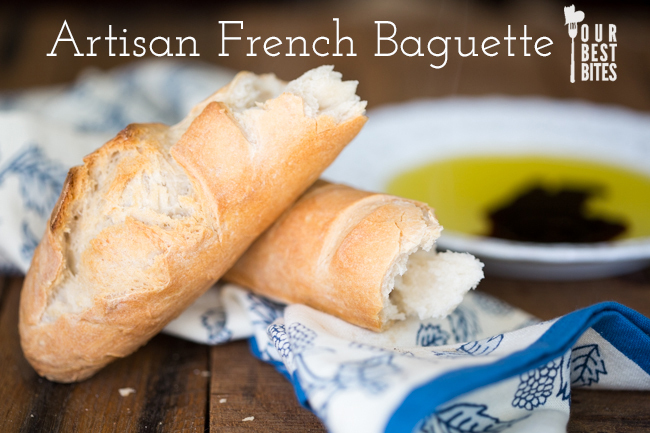 Use or refrigerate immediately. The cheese will firm up even more in the fridge. You'll see this tomorrow in my palak paneer. But, if it tastes good, I'll make another batch to try Priya's Paneer Pizza. This month the Pass the Cookbook crew - under the leadership of Kita, the culinary force behind Pass the Sushi - is cooking from Cooking Up a Storm: Recipes Lost and Found from the Times-Picayune of New Orleans by Marcelle Bienvenu and Judy Walker. 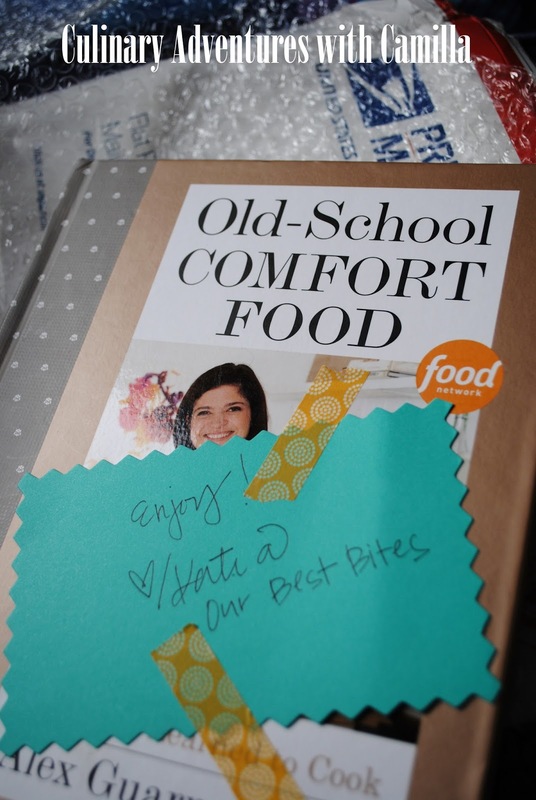 The cookbook was intended to connect people who lost their favorite family recipes when Hurricane Katrina devastated New Orleans in 2005. The recipes are assembled from local papers that people had clipped and saved throughout the years. After the hurricane, people were hunting for their saved recipes, submitted comments and questions, and other readers did their best to match up the recipes. This book is a collection of some of those. For that reason alone, it is an amazing publication. As always in this group, we had the choice of three recipes. Our selections this round: Chicken-Sausage Jambalaya, Crawfish in Saffon Cream, or Bananas Foster Pie. 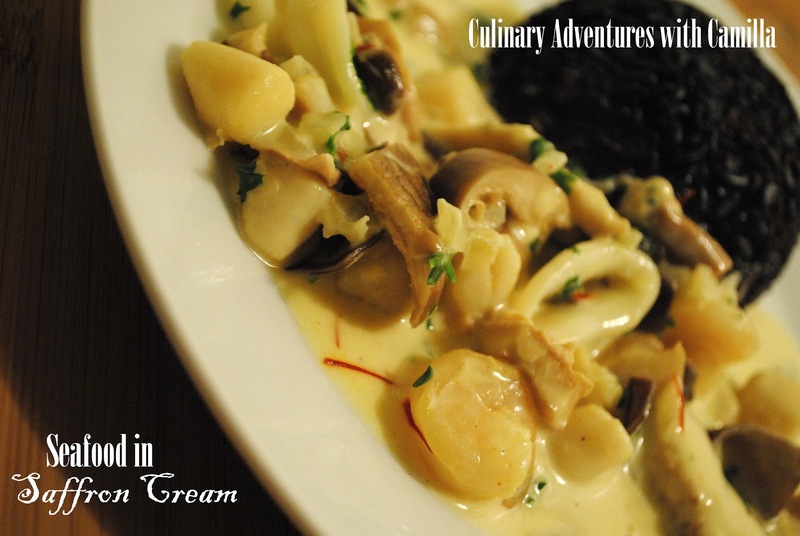 I decided to adapt the crawfish option, making a Seafood in Saffron Cream. 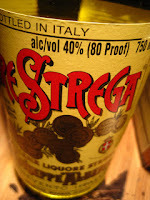 I skipped the sherry and vermouth, swapping in Liquore Strega - a saffron liqueur - and a Sauvignon Blanc. Also, I chose to use a mixture of seafood instead of trying to get my hands on crawfish! Melt the butter in a splash of olive oil in a large, flat-bottom pan. Add the shallots, onions, and fennel. Saute over medium heat for 5 minutes, then add the mushrooms. Cook for another 5 minutes, stirring occasionally. Meanwhile, put the saffron in the Sauvignon Blanc and stir. 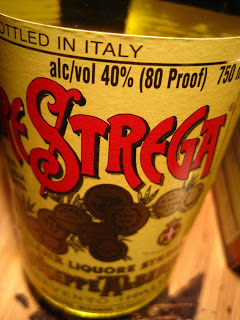 Let stand for a few minutes, then add to the pan with the Strega. Cook until the liquid has reduced by half. Pour in the cream and fold in the parsley. Cook to reduce the sauce until slightly thickened. Add the seafood and cook till opaque. Season to taste with salt, pepper, and paprika. Serve over rice. I was reminded tonight why we embarked on this culinary journey when the boys pulled out their atlases as soon as I announced dinner was from Saint Lucia. I remember someone commenting once - at a school meeting - that kids don't use atlases anymore. I beg to differ. 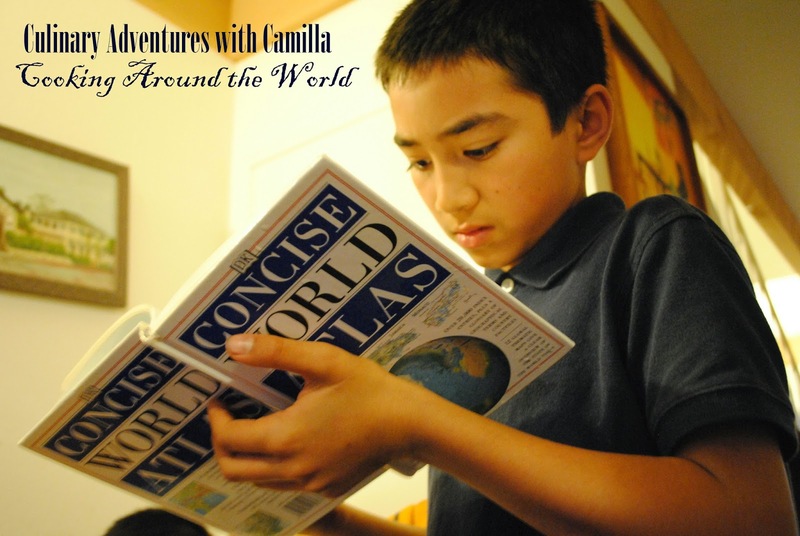 My boys can't share an atlas; they bicker over who gets to use it. So they each have their own! Saint Lucia is an island nation in the Caribbean; it's considered part of the Windward Islands and gets its name Santa Lucia of Syracuse. The British gained control of the island in the early 19th century, with the goal of developing the sugar industry. And though they declared their indeperndence, in 1979, Saint Lucia still recognizes Queen Elizabeth II as its sovreign. That's a wrap! We're headed to Saint Vincent and the Grenadines next. Can't wait to finally tackle a Caribbean Black Cake.